Once in a while you get some acts that are generalised as an amalgamation of two or more genres. BONESTEEL is one such band; a collective where the artists play a genre that wisely blends the elements of Hard Rock, Alternative Metal and Nu Metal. Even though the band cannot be directly classified as any one of the aforementioned genres - since their sound lacks to showcase huge influences - their sound can be described using an umbrella term: Heavy Metal. BONESTEEL has a strong tripod of members and each one of them has a big and important role to play in the production. These talented American musicians gathered to record their debut album "Epitome of Infamy", which was released in the year 2016. Artwork is an important aspect of any album as buyers often consider buying attractive ones rather than dull ones, and upon closer inspection we get to see the beauty of this artwork. The "Infamy" is personified using a malicious person wearing a hood in order to hide his profanity. 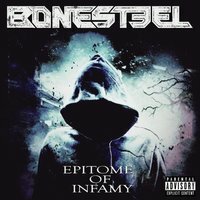 The album itself flaunts six tracks that sum up their three years of hard work in the making of "Epitome of Infamy". After a slow and passive intro track with a tinge of rap style vocals of "The Pisces" the band showcases insane anger through the hard hitting single "AlcatraZ". Even though the mid-tempo hooks might perplex you a bit, the song regains its true form after the slow tempo breaks. "This is AlcatraZ, my Albatross there is no way left for me to run, All I can do now is to find my Redemption" highlights the pinnacle of their songwriting skills. The lyrics are deep and depict the real life incidents of the artists. Title track "Epitome Of Infamy" sounds like if DISTURBED had collaborated with FIVE FINGER DEATH PUNCH to make a track; which is no surprise if you have done enough homework about these guys. Primarily influenced by FFDP, DISTURBED and GEMINI SYNDROME, BONESTEEL began writing music in worship of the foregoing acts. The croaking intro of "Epitome Of Infamy" might be catchy but becomes boring when done repeatedly. Apart from that this is a decent single. After the abolishment of three adrenaline filled songs we are now left with the last set of the tracklist. One amongst this set is "Going For The Kill", which is in no way close to being melodic. Dwelling on the same energy of "AlcatraZ", the track is a heavy yet unoriginal. The reason being for that the fact that most of the instrumentation reminds you of ROB ZOMBIE or RAMMSTEIN; but apart from that this song is definitely a heavy anthem. The chorus is catchy and the part that accompanies it portrays huge influence from latter band. Ensuing the RAMMSTEIN-esque vox is an arranged chaos; with insane shredding that unfortunately lasts for a very short time. Before going on to the next song here is a bit of background information on the band's instrumentation; for if you are an ardent observer of music you might have pointed out a flaw in it. The fact being, the band actually lacks a bassist. Well, in a generation where most of the music is solely focussed on guitar sections rather than bass, being an old-school music monitor I enjoy a hue of a bass section, whether it is a solo or a small transition part. That being said, I appreciate the band's effort in making music with complete utilisation of the accessible members. "Mythic Vision" reminded me of Sci-fi novels when the opening seconds of the track glazes you over with the atmospheric effects of the music. With a familiar drum fill the song detonates with a full-fledged aggressiveness when the guitar riffs become much heavier supported by a simple yet beckoning double bass kicks. The interesting complexion of this track lies in the use of an orchestral sample towards the end of the song that many people might not have heard, but that section captivated me for some reason. Wisely blending the orchestral sample with a decent guitar solo, the song is melodic as well as energetic. All is well that ends well. The closing track "Everest" is a throwback to the Rap style vocals. The alluring part of this song is the distorted and heavily prominent guitar works in the chorus and of course, the delivery. The vocals showcase immense anger and the vocalist has done an almost perfect job on this song. The ending harmonic guitar riff just made my day, but again, it was unfortunately short-lived. Overall this is a decent job done by BONESTEEL, but for me, most of the memorable parts were short-lived; nevertheless, I'm happy that the band used them at least for a short period of time. Considering the fact that these guys are relatively new to the metal scene they have done a pretty neat job. For me, the album is the epitome of their sound and the band is yet to set up a strong benchmark, as most of the songs are unoriginal. However, no band can be perfect, each and every outfit requires some time to build their musical essence. I will look forward to whatever BONESTEEL puts up next.